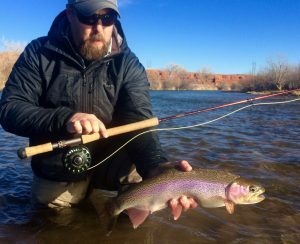 Dubois Area Fishing Conditions: The Dubois area is the headwaters for the Wind River and Bighorn River. The Wind River and many of its tributaries are at peak muddy flows right now. 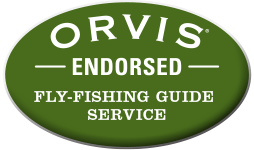 If looking to fish the area we have had guides on the mountain lakes. 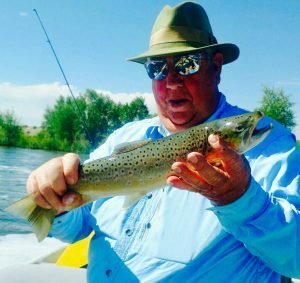 The upper elevations are starting to improve and we have had success fishing these areas. 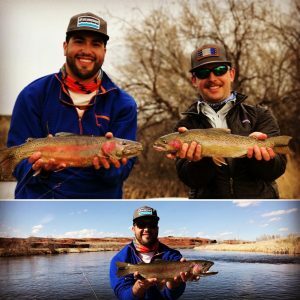 Some of the high mountain creeks are becoming fishable. We have not really had any big hatches come off yet, so we are looking forward to the next several weeks as water conditions improve. 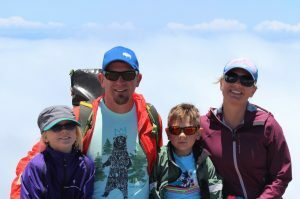 We are taking bookings right now for the mountain lakes and high mountain streams right now. 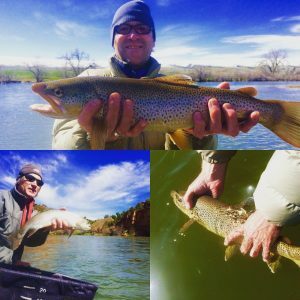 Bighorn River Fly Fishing Spring Report: The Bighorn River in Thermopolis is currently flowing at 2067 cfs and Boysen Dam is currently sitting at 87.1 % full, which is slightly down from last week in the reservoir. 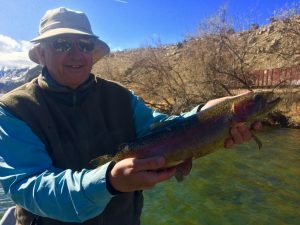 The Bureau of Reclamation is upping flows early this year due to the high snowpack and anticipated high water flows this year. 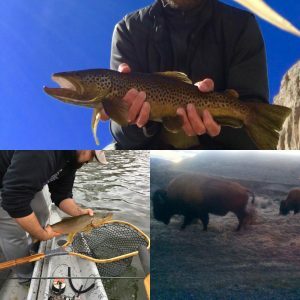 To see most current Wind River/Bighorn River water flows and information click HERE. 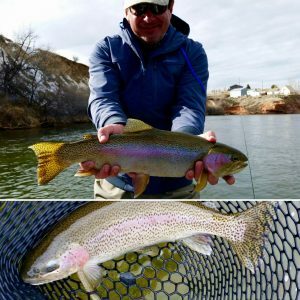 Fishing on the Bighorn has definitely picked up from the winter. 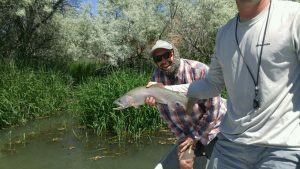 The fishing has been great and we are really enjoying the higher water flows. 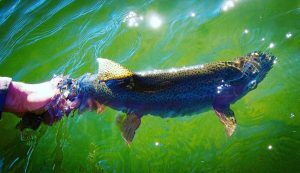 The spawning fish are going to get a little more relief this year with the higher water flows. 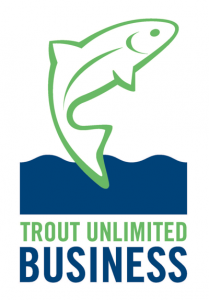 Wedding of the Waters is getting crowded on the weekends and anglers are definitely excited to get out and fish. 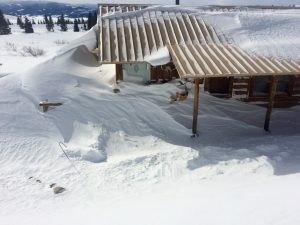 You can tell it has been a long winter and cabin fever has set in. Hot flies include annelids, sow bugs, midges, streamers. We had a wonderful day this week with long time friends and guests, Pam and Steve. It is always a treat to fish with such great people! 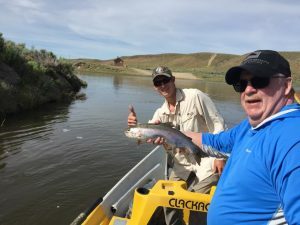 Bighorn River Fish Camp Thermopolis, Wyoming: Dunoir Fishing Adventures is slowly developing our property on the Bighorn River. 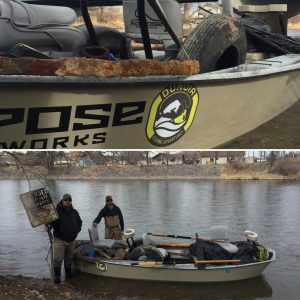 Our good friend, Jason Redman and the Phat Foam Crew helped us out this weekend move our composting toilet and worked on improving our river access road to our private boat launch. 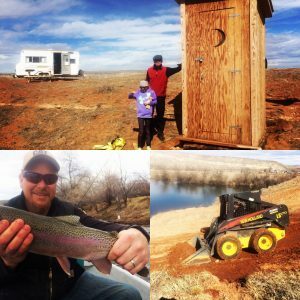 We are slowly working on getting the Bighorn River Fish Camp set up. 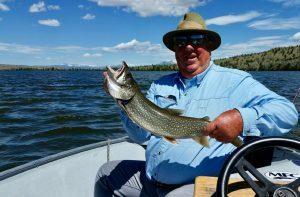 Right now we are using fish camp for our guides, friends, and family but do have plans for our fishing guests. Keep posted for more to come. Thanks again to Phat Foam, Steve and Pam, and our wonderful family and friends for such an amazing weekend working and fishing. We are truly blessed!